Before you start sending emails to your customers and leads, you must create the Email Campaign. This can be later associated to a lead, or an opportunity. 1. Click ⊕ New on your Email Campaigns App. 2. This opens the Email Campaign screen. All fields marked with an asterisk (*) are required. Campaign Name: Give your campaign a descriptive and unique name (e.g. March fundraiser). Assigned To: Assign a Method user to the campaign. By default, the user signed in is selected. Status: Give the campaign a status. By default, the status is set to planned. Start and End Dates: Assign a start and end date for information purposes only. If you set the start date for the future, pressing Send Emails will still immediately send the emails regardless of this date. Description: Give context to your campaign. 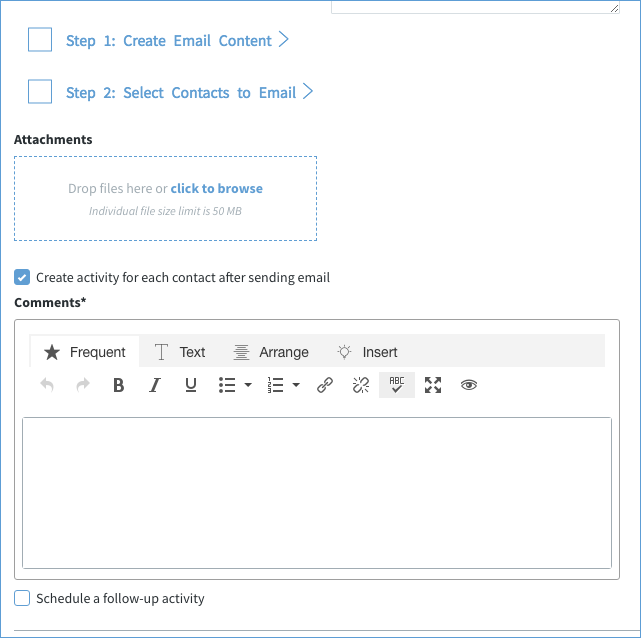 Step 1: Create Email Content: This will take you to another screen to create the email to send out. Step 2: Select Contacts to Email: This will take you to another screen to create the list of contacts you wish to send the email to. Attachments: These attachments will be included in the email you send out. 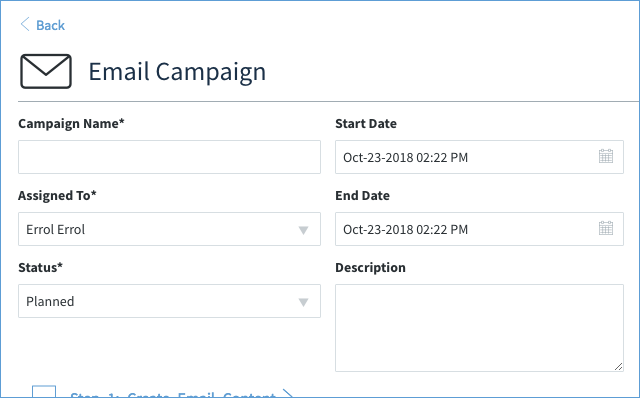 Create activity for each contact after sending email: For every contact you send an email to, an activity will be created to indicate they were included in this email campign. Comments: Comments for the activity created above. Schedule a follow-up activity: For every contact you send an email to, a follow-up activity will be created. Checking this box will let you set the parameters for the follow-up activity. When you are finished creating your campaign, there are a number of buttons. Duplicate: All information from the campaign, including email content and mail list, are duplicated. The campaign is given the title Copy of [Campaign Name] and can be edited. Save & Back: Save the campaign and go back to the previous screen. This does not send the emails. Send Test Emails: This will send test emails out. Send Emails: This will send out the email campaign to all the contacts selected in Step 2 above. Save: Save the campaign, but do not send out emails.